Wow, what a month December has been already! Can y'all believe that we're less than two weeks away from Christmas?? It's just so hard to fathom, honestly. I'm actually flying out to Orlando on the 22nd and already dreading the packing for a week in sunny Florida. I mean, how does one pack for warm weather temps, when it's almost winter. I can't even tell you where my summer clothes are, nor am I comfortable showing off my pearly white legs this time of year. No thank you. While I comb over what I'm going to pack, one decision that has already been made is what to put all my stuff in. To pack as minimal as possible, I'll be taking one suitcase and one carry-on bag. Thankfully I picked up the perfect canvas tote, just in time for the holidays. If you're like me, you probably own a plethora of tote bags. 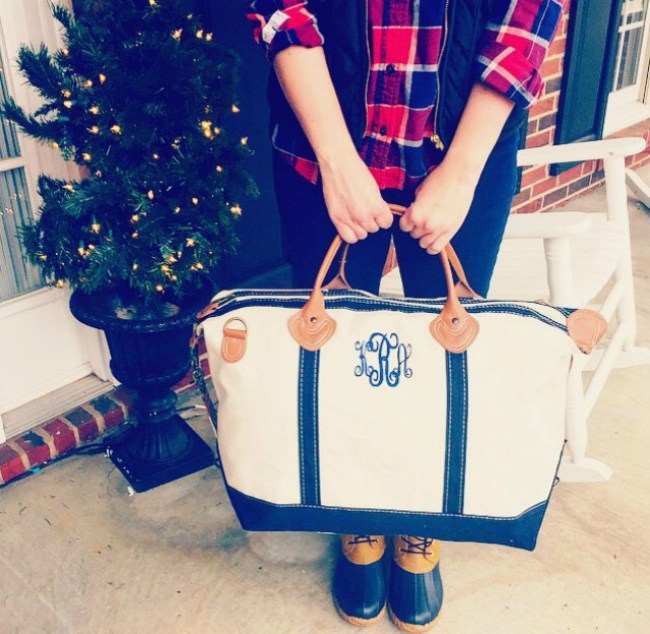 If you're able to fill up the car, I recommend snagging one of these monogrammed totes from Marley Lilly. I already used mine for Thanksgiving travel, and look forward to using it again for the upcoming holidays. The canvas material is heavy, so the quality of the bag is worth the price for sure. I also love the monogrammed touch. That way, you know exactly whose bags are taking up the entire trunk of the car, ha! Where's everyone heading off to for the holidays? I'll be sharing more about my trip next week, but for now... let's end the week on a little link love shall we? Loved wearing this shimmer midi skirt yesterday to a holiday party. Hint, it's only available online! Just ordered this Christmas Sweater tee from Lauren James for my holiday trip to Disney World! Can't wait to wear it around the parks! As I gear up for the big apartment move in a few weeks, I've been pinning like crazy. Thinking of using this pillow as living room inspiration. I'm also adding this plum colored mixer to my wish list. I'm so not a runner, but these gold Nike's might change my outlook on working out. Instagram Husband - if you haven't seen this video, it's hilarious and accurately depicts the lives of blogger significant others. Those poor, poor souls! Thanks for putting up with us, ha! By far the best piece of relationship advice I've ever read. Don't settle. Wait. A letter to every young girl. If he won't, someone else will. As if we expected anything less from KJP and Sarah KJP... swooning over their Christmas Tree farm wedding! A little less than a month stands between us and the new season of The Bachelor. Get to know all the women vying for Ben's heart, here. Another hilarious Adele spoof for all the mom's out there! The most photographed places in the South. You'll be surprised what location is most popular for each state. Let's just say, I was dead wrong about Tennessee. Fashion Santa... the best looking Santa I've ever seen!! Ladies, check it out! Missed my gift guides? No worries! Get some last minute gift inspiration for HIM, HER, the holiday hostess or a few stocking stuffers! The perfect holiday outfit for your Christmas party or dinner. The perfect holiday outfit for a girlfriend's gift exchange or cookie swap. Speaking of travel... even more tote-ally awesome inspiration! Add a little sparkle and holiday glitz to your bar cart! Delicious Red Velvet and Chocolate Crackle Cookies recipe. Coming up next week on the blog: Another fun week ahead on the blog... sharing some outfit inspiration for New Years Eve + the final installment of the holiday happenings series + sharing some of my mom's homemade Christmas Candy recipes. I'll also be rounding out the week with another link love post and sharing more about my Christmas break trip to Disney! Keep up with Kristyn on Facebook, Instagram, Twitter and Bloglovin'! Instagram husband has had me cracking up so much! I know, right?! I was dying laughing watching it! Auld Lang Syne, Welcome 2016!